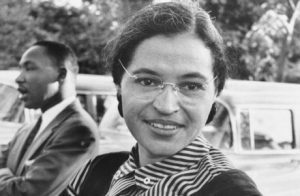 61 years ago today, Rosa Parks refused to give up her seat to a white passenger on a crowded bus in Montgomery, Alabama. She wasn’t tired from working all day. The long time NAACP member did it on principle. Ms. Parks realized at the time that more than 75% of the riders on the public bus system were black and surrendering your seat based on race at the time was the law. She was arrested and the NAACP bailed her out. Ms. Parks lost her job. The boycott of the bus system lasted 381 days, fiscally hitting the city and bus line where it hurts – declining revenue. Ms. Parks sit down, was a catalyst for ending segregation in this country. I pay tribute to her today for not standing. It was exactly what we need. Do you know any modern day Rosa Parks? Yes, I know a modern day Rosa Parks. My daughter, Timara exemplifies qualities of Mrs. Parks. She is tenacious, aggressive, outspoken, and list goes on!!! When I was recently fired from my job because I wouldn’t keep moving from one location to another. Tamara is the one who said, ” Mom, that’s the reason people do that to us, because we as blacks do NOTHING about it!!! From that point on, I have been reading more trying to figure what is the best path to take. Kudos, to my beautiful daughter, Timara!!! !